Drain down the coolant to a point below the water pump. Catch the coolant in a clean bucket so you can recycle it back into the radiator. Store it in a safe place AWAY FROM PETS. The stuff smells sweet but can KILL an unsuspecting dog or cat. Carefully remove the three hoses from the coolant intake manifold behind the pump. 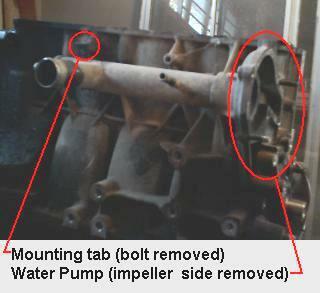 It is located under the engine's intake manifold and carburetor. Remove the 10mm mounting bolt that secures the coolant intake manifold in place. It may be necessary to remove the alternator and items mounted on the right wheel well to get to this bolt. Also note that the bolt head is partially obscured by the coolant intake manifold itself. As a result, you'll need a very short 10mm socket with a pivoting ratchet extension in order to successfully remove this bolt. The alternative is to remove the intake manifold (carburetor and all). This gives you easy access to the bolt head with an 10mm open end or box wrench, but you end up having to replace the intake manifold gasket. Slide the coolant intake manifold out of the back of the water pump noting the "O" ring's position. Remove the "O" ring (or what is left of it) and obtain a replacement at a car parts store. The factory "O" ring is somewhat special in that is has a rectangular cross section. The outside diameter of the coolant intake manifold is approximately 1.75 inches. Replace the "O" ring in it's groove at the pump end of the coolant intake manifold and re-assemble the coolant intake manifold in the reverse order described above. Be SURE to tighten down the mounting bolt firmly.